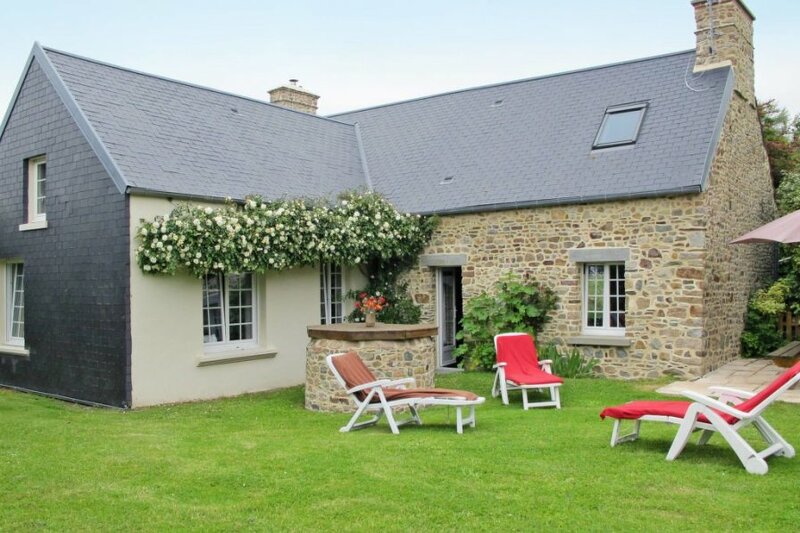 This 3 bedroom house is located in Créances and sleeps 6 people. It has WiFi. The house is near a beach. Semi-detached house, 6 people, 4 room/s, 3 bedroom/s, 1 bathroom/s, approximately 130 m², 2 floor/s. Further holiday makers live in separate semi-detached house. Feature: Property on an estate (2 units in total). Furnishing: holiday standard, rustic, pleasant, tiled floor, wooden floor. Equipment: satellite TV; DVD; internet access Wi-Fi (payment); washing machine, iron/ironing board; electric heating; storage room (external access only). Electricity according to consumption approximately € 0.18/​kWh. Final cleaning by tenants or against payment, € 60. Holiday resort tax. Linen/towels must be brought along. Bed linen available on loan, € 8 per person/​change (on order). Towels available on loan, € 4 per person/​change (on order). Deposit € 200 (in cash). Extra bed free of charge (on order). Cot free of charge (on order). High chair free of charge (on request). Pet 2 animals allowed, € 15 per pet and stay (please advise prior to arrival). Internet € 10 per week. Situation: in the hamlet, rural. Sports facilities/ leisure time: shared use (free of charge): table tennis table. Plot description: private part of the estate approximately 500 m², partially surrounded (hedge, wall), trees, well-kept, lawn. Terrace, furnishing provided (benches), 4 deck chairs, brick barbecue. The agent describes this house as an ideal holiday rental for the summer holidays. It is also good value for money. This house is located in Créances. It is set in a very convenient location, just 0 metres away from a beach and only 3km away from the city center.